Performing With Power and Control With the Ford Taurus | Randy Wise Ford Inc. 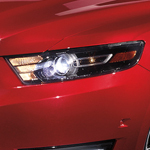 The Ford Fusion has a lot to offer when it comes to performance. We at Randy Wise Ford Inc. have seen that it has a lot of the features that make it easier to control a vehicle. We checked out the features and are certain that our customers are going to be more than satisfied with what this vehicle has for them. Perhaps the most important feature to look at is the automatic shifting. This vehicle has an Electric Power-Assisted shifting transmission which makes the car shift seamlessly into higher gears at the speed you are going. This comes with the sport mode which gives the car the extra edge for your ride. The All-wheel drive and the curve control features are also something that makes this vehicle worth the purchase. You will be in greater control of the vehicle than you would imagine. The road conditions would be very little problem for the Ford Fusion.